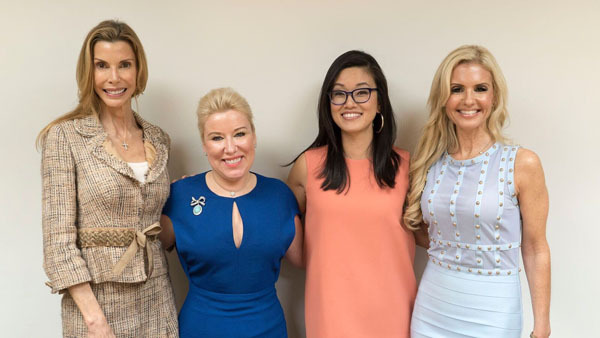 On September 27th, renowned family law attorney Karolina Dehnhard hosted the first of several exclusive “Breakfast with Betty Liu” events at the Budd Larner office in Short Hills, NJ. Over 40 top business leaders, professionals and entrepreneurs came out to hear Betty Liu, Bloomberg TV Anchor, Founder and CEO of Radiate, share the story of her broadcast career and lessons learned. They were given a sneak peek of the new Radiateinc.com website launching this fall. Resident Magazine sat down with Betty Liu after her speech for a 1:1 interview. First, please give us the background how you came up with the idea for Radiate? The idea of Radiate started with my best-selling book Work Smarts: What CEOs Say You Need To Know to Get Ahead a couple of years ago. I felt there was an opportunity to create a new platform to bring Executive Education, which has traditionally been reserved for the C-Suite, to everyone. After getting the OK from Michael Bloomberg to pursue this entrepreneurial endeavor while staying on as an anchor at Bloomberg TV, I started this company 18 months ago. Radiate is a question and answer website focused on developing the next generation of leaders –we’re totally reimagining the way we develop people into leaders. So what is Radiate today as you get ready to launch your Radiateinc.com website? Radiate’s mission is to enable people to reach their full potential by harnessing the power of expert advice. We offer insights and exclusive access through our collection of videos featuring Experts in leadership. Our Experts help people solve problems, gain perspectives and learn new business skills. Users can sign up for a monthly subscription to get unlimited access to our ever- growing video library of answers on all sorts of leadership, productivity and soft skills. Thanks to the help of Visionary Members, like Karolina Dehnhard, we’ve been able to get positive feedback on our product over the past couple of months and we are excited to show it to everyone. Who are some of the 100+ CEO and Industry Titans that you’ve interviewed so far for Radiate? I’ve been really fortunate that so many people have signed on to help share their expert advice with others. We’ve interviewed Tim Armstrong (Oath), Steve Schwarzman (Blackstone), Jonathan Tisch (Loews Hotels & Co.) and Earvin “Magic” Johnson to name a few. What advice would you give to other first-time entrepreneurs who are just starting out? Culture is uber important. I learned a greater appreciation for corporate culture since I started Radiate. A strong corporate culture is critical in recruiting and retaining team members, differentiating yourself in the marketplace and providing the vision and “true north” for your company. We just had Casper’s CEO Philip Krim join Radiate and he said one of the things he implemented early on was the “no a—holes” rule. He wanted only “good people” working at Casper. And the more you grow, the more important it is to do an audit of your culture every year or few years. To ask yourself: Are you still staying true to it? What was it like to tell your own personal story of your career and hard work to launch Radiate with your “Breakfast with Betty Liu” event series? It is incredibly rewarding for me to be able to share with others the lessons I learned, and mistakes I made, along the way. I just celebrated my 10th work anniversary at Bloomberg and I’m incredibly fortunate to be able to work for such a great company and have Michael Bloomberg as one of my mentors. It is my hope that by sharing my own experience learning the importance of soft skills and taking the time to learn the skills and mindset that it takes to be a leader, that I can inspire and share these lessons with others. I always learn a lot from being in a room with such driven and motivated people like the one Karolina Dehnhard organized for us today. “There really isn’t true work-life balance. When you love what you do you don’t actually need work life balance. Because work is your life and life is your work. Liu stated that when you love what you do it gives you so much energy which makes you find the time and gives you even more time. When I asked her what is the biggest lesson her parents taught her is, she spoke about how the goals you have and success you want must be earned through hard work. The biggest lesson she will pass on to her boys is that she wants them to take risks and not let fear take over the pursuit to their happiness or goals in life. Be confident in life and don’t settle. I was so touched by the comment because this is what I tell my son. Betty says take action and don’t let fear prevent you. At least if they fail they learn from it. Betty is so grateful and feels so connected to people as she shares her stories and is honored that people will share back with her. Hearing people give her advice throughout her life and people saying the right words in the right moment can truly change your life and that is what I know Radiate can do for so many people. As always, we like to ask what her favorite places are. She states one of her favorite restaurants in NYC is Per Se where she had a private dinner for Radiate with Chef Keller and loves Sumba, an island in eastern Indonesia. It truly impressed her with its gorgeous landscape and waves for surfing. What a great event with Betty Liu at Budd Larner and we are looking forward to her next chapters.